With summertime boating season underway, it’s important to remember that impaired driving isn’t limited to the roadways. Boating under the influence (BUI) is just as dangerous as drunk driving and it’s illegal in all 50 states. 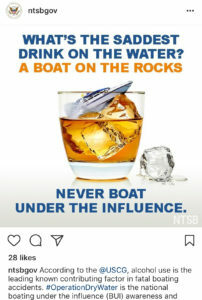 According to the U.S. Coast Guard, alcohol is the leading contributing factor in boating deaths, accounting for 15% of all recreational fatalities. In 2016, alcohol played a role in 335 boating injuries and 133 deaths. Just like drunk driving, alcohol impairs a boater’s judgment, vision, balance, and reaction time. However, these effects can occur more quickly out on the water. A boater operator’s coordination can be slowed by “boater’s hypnosis”—the combo of motion, vibration, engine noise, sun, and wind—which speeds up the impact of alcohol in a person’s system. And excessive drinking can be just as dangerous for passengers. An intoxicated passenger is more likely to fall—either inside the boat or overboard—leading to serious injury or drowning. Alcohol can also heighten a boater’s inexperience. The average boater only spends 110 hours on the water each year, meaning they may not be as confident operating a boat as they are driving on the road. Add that there are no lanes, lights, or turn signals, and that most boaters aren’t required to obtain special training, and you end up with a dangerous or potentially deadly situation. Over the weekend leading up to the Fourth of July—a time when both boating activity and drinking spike—ODW will conduct a nationwide awareness and enforcement campaign. The goal is to inform and educate boaters on the consequences of boating under the influence and to prevent them from hitting the open water if they have been drinking or using drugs. Since its launch in 2009, ODW’s annual three-day campaign has resulted in the removal of 3,038 boaters for BUI. During the 2017 campaign, law enforcement confronted 243,853 boaters, resulting in more than 33,000 warnings or citations and more than 500 BUI arrests. The post When It Comes To Boating, Alcohol and Water Don’t Mix appeared first on Sobering Up.